The blended classroom approach to learning is becoming increasingly popular. This is because more and more businesses and organisations want to realise the benefits offered by e-learning, but don’t want to do that at the expense of face-to-face learning. In other words, the type of learning delivered in a classroom. This is a sensible approach in many situations (and that’s coming from an unapologetic e-learning advocate!). After all, in the real world, one size rarely fits everyone. With a blended classroom approach, you take the best teaching methods available and mix them together. You do this in quantities that suit your objectives, the type of course, and the learners who will go through it. 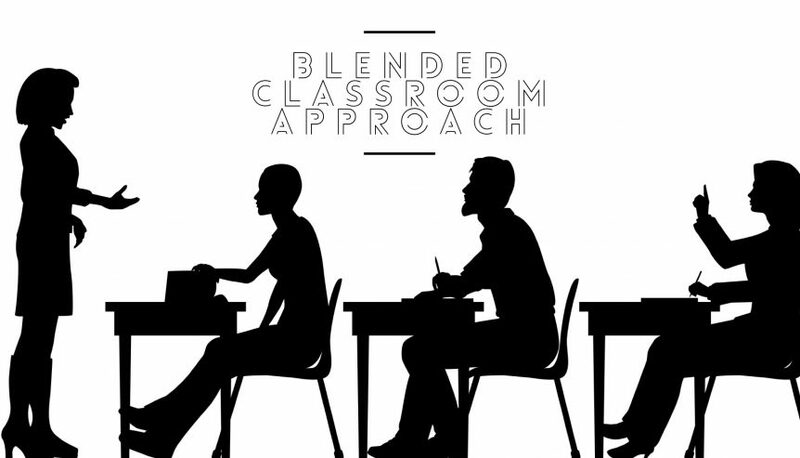 What Is the Blended Classroom Approach? A blended classroom approach, or blended learning, combines multiple teaching methods to deliver a course. Usually, this means using both e-learning and face-to-face learning. Sometimes, the core part of the course is the classroom element while in others, e-learning is the primary delivery method with some classroom-based sessions or activities. In terms of e-learning elements specifically, they enhance the training as a whole and make it more effective. In addition, e-learning technology directly enhances the classroom and face-to-face sessions of a course. The classroom-based part of a course is the traditional element. We’ll, therefore, focus on the e-learning aspect and how best to use it. Pre-course – learners go through e-learning modules in their own time before attending the classroom sessions of a course. This introduces the learner to the topic and ensures they have sufficient knowledge before they get into the classroom. It is also helpful to outline what the learner can expect from the course, as well as what is expected of them. You can include social elements too so learners can meet and interact with others who will join them in the classroom. Finally, pre-course e-learning elements can include interactive quiz and assessment modules. This provides classroom tutors with valuable information on the abilities and/or knowledge of participants long before the face-to-face sessions start. During the classroom part of the course – face-to-face learning techniques will dominate this phase but e-learning elements enhance the experience and improve results. Examples of how to use e-learning in the classroom include workshop modules, role play scenarios, quizzes, games, and more. Post-course – this gives you the opportunity to reinforce learning, maintain engagement, and get feedback. You can also release updates to course material if it becomes available, and provide support to learners as they implement and/or use the newly acquired skills or knowledge. Caters to the individual needs of students. A more personal way of delivering a course as modules can be personalised. In addition, learners are in control of how quickly they proceed through the e-learning elements, and they decide what modules or topic areas they need to focus on. More flexible approach to course delivery as learners can access e-learning materials and modules wherever they are and whenever they want. Frees up teaching resources as you only deliver part of the course in a classroom situation. Ensures consistent delivery of course materials as you only deliver a portion of the course in the classroom. All participants, however, go through the same e-learning modules and elements. This particularly applies when you have large teams that involve multiple classroom sessions to cover each individual. Learners can more easily monitor their progress compared to classroom-only learning. This improves their motivation and highlights areas for improvement. It is also easier to monitor the performance and abilities of the learner through assessments delivered via e-learning modules. Creates a sense of ownership as the e-learning elements encourage learners to be active participants in the course. Enhances independent learning skills and abilities. With a blended classroom approach, you don’t have to decide between delivering a course in the classroom or via e-learning. You can do both and in doing so, you will get better results.